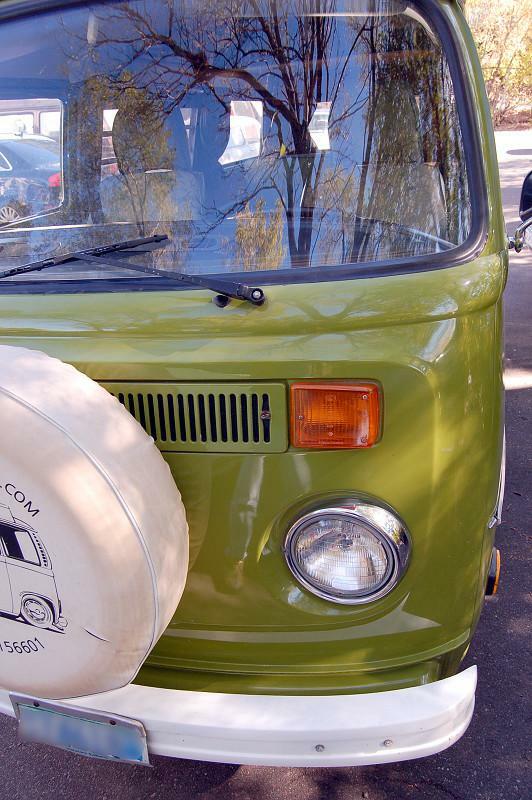 We had a mission: to find a '76 - '79 Sage Green Deluxe Westfalia camper. It had to as original as possible, mostly rust-free, and running. My restoration experience is with Ford Musclecars. This is our other "old" car, factory correct down to the nuts and bolts. VW is entirely new to me, but that's part of the draw. However, it was a real shock to see how poor the bodies were on these buses. I'd seen rusted Mustangs, but you didn't have far to go to find a good one. With VW buses, it seemed even the ones outside the salt belt were rusted and generally used up. I chased one after another down only to end disappointed. One seller in Southern California even stole my deposit and disappeared when it finally came down to agreeing on a price. I got jerked around waiting weeks for photos when sellers couldn't seem to find it in themselves to show more than a couple blurry shots. 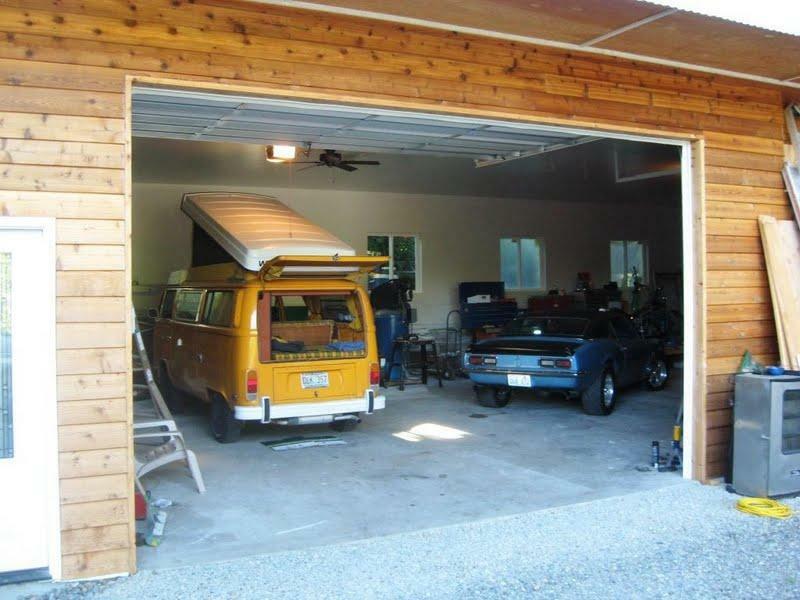 Campers represented as well-maintained turned out to have significant mechanical issues once examined by a mechanic. All this done long distance, it was enough to make a guy give up ... almost. A couple months ago when I hadn't been looking in a long while, I came across and ad in TheSamba classifieds that had been posted that same day. Of all things, the camper for sale was local. This is almost amazing as Minnesota is a virtual "desert" for these things. 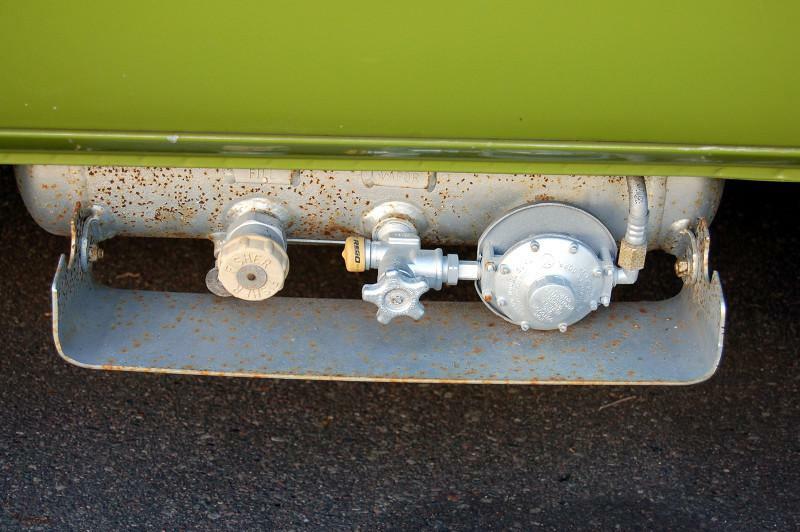 As if finding one local wasn't incredible enough, it was a sage green, deluxe Westy, originally from California, running with all of its original fuel injection equipment. It had issues, but seemingly ones I could deal with. That's the story in short. 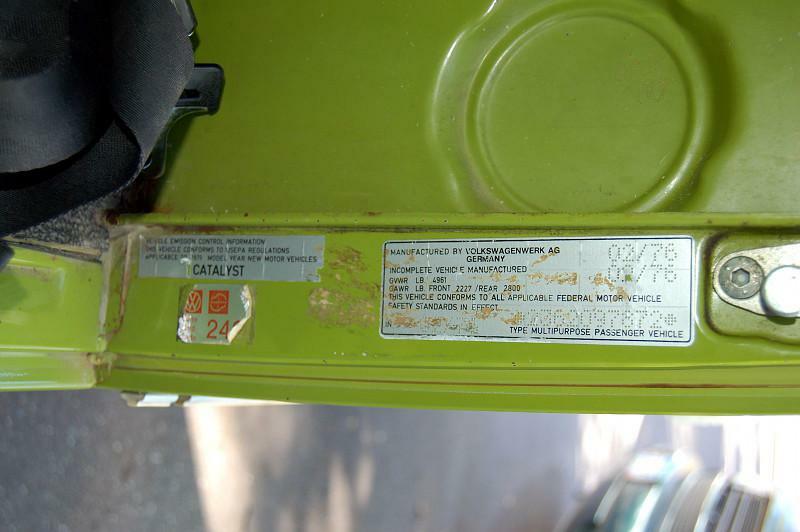 What follows will show the original condition of this camper and then try to show things being fixed, found, replaced, and refurbished. I'm not in a good position to restore it now. In the short term the focus will be on achieving a reasonable degree of mechanical reliability and basic cosmetic improvements without sacrificing originality. I hope to undo the manifold sins of previous owners. Way to go Jon. I'm looking forward to seeing more pics, and following your progress. Very nice Mustang by the way. 1969? My Dad has a small fleet of them: 65 convert, 66 Fastback, 67 Fastback GTA, and 67 Coupe. 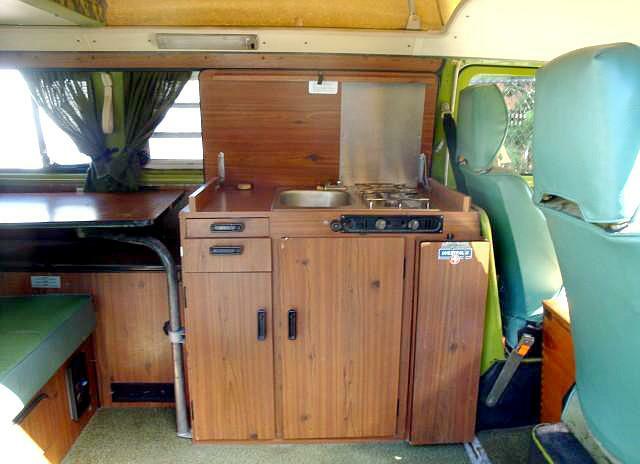 He was always disappointed that I became a VW guy, but after seeing our buses in action at shows and campsites, he said that he would like to restore one before he gets too far down the road. Keep up the good work. It's got shiny, new-ish paint with relatively little dirt in it. That's about as complimentary as I will get. A keen eye will spot that the dogleg and rear wheelwell/battery corner is a somewhat different shade of green. This varies from not being visible to standing out like a beacon depending on what light hits it. There has been some rust repair, but it is surprisingly minor from what I can tell with a magnet and careful inspection in and around the affected areas on a lift. Cheesy old vinyl stripping was applied along the length by a previous owner. Maybe it saved a few dings along the way. The sliding door works very well. 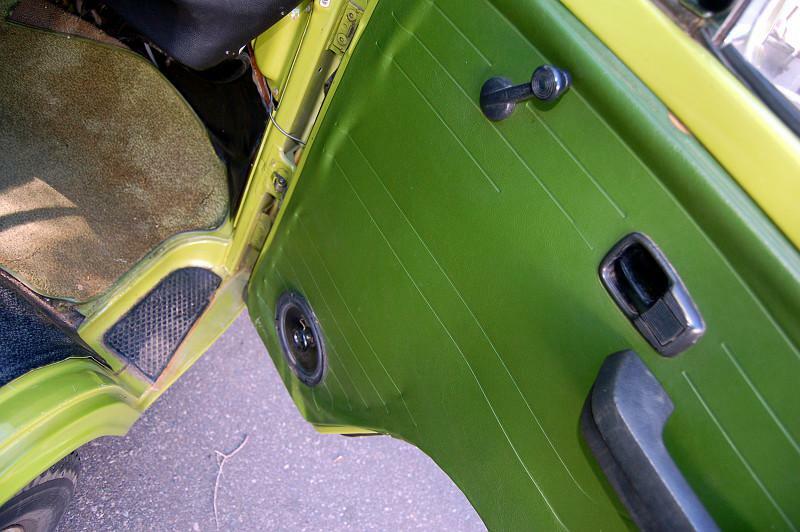 The fiberglass top is pretty weather-checked, with minor damage at the front edge of the luggage rack. It's got a newer tent installed, so that's at least one less thing to replace. The propane tank is looking pretty sad. Nothing a beadblast and paint can't remedy, as the valves work and it demonstrably holds pressure without leaks. There's also some kind of aftermarket step that's been added. It was in even worse condition than the propane tank and has since been removed. Unless I find out this is some kind of rare option, it's going to end up in the trash. 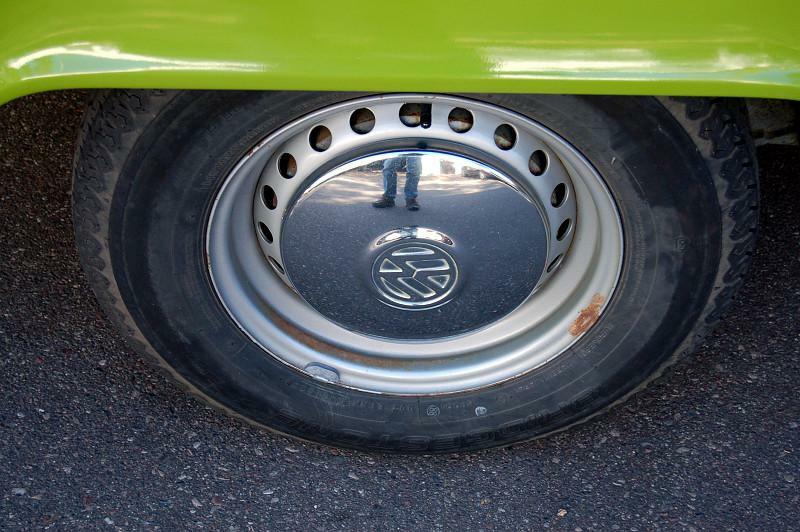 Here's a look at one of the wheels and hubcaps. The wheels definitely need to be sandblasted and repainted, but the hubcaps are in good shape. You can tell by the rust on one side of the wheels that this bus sat a lot. Coming around to the back of the bus, we find one of the first "cardinal sins". 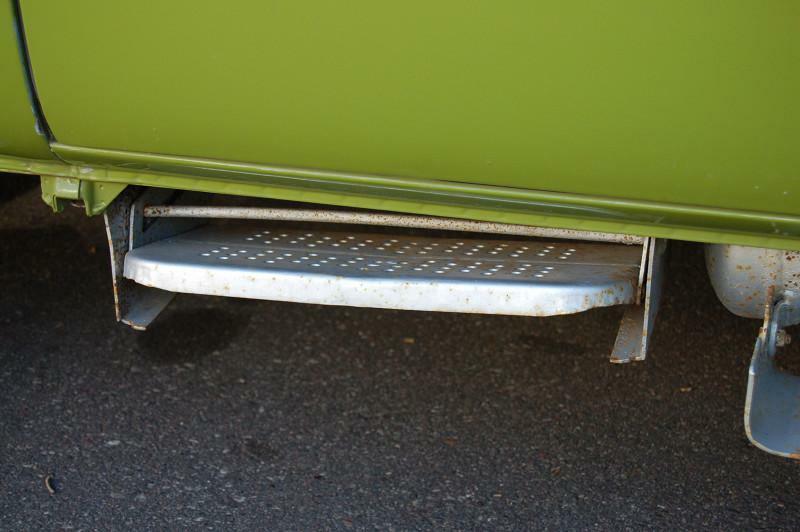 I can understand the tail lights are pretty small on buses, but driving sheet metal screws into perfectly good sheet metal to attach a trailer reflector? WTF! Yeah, that'll buff out! 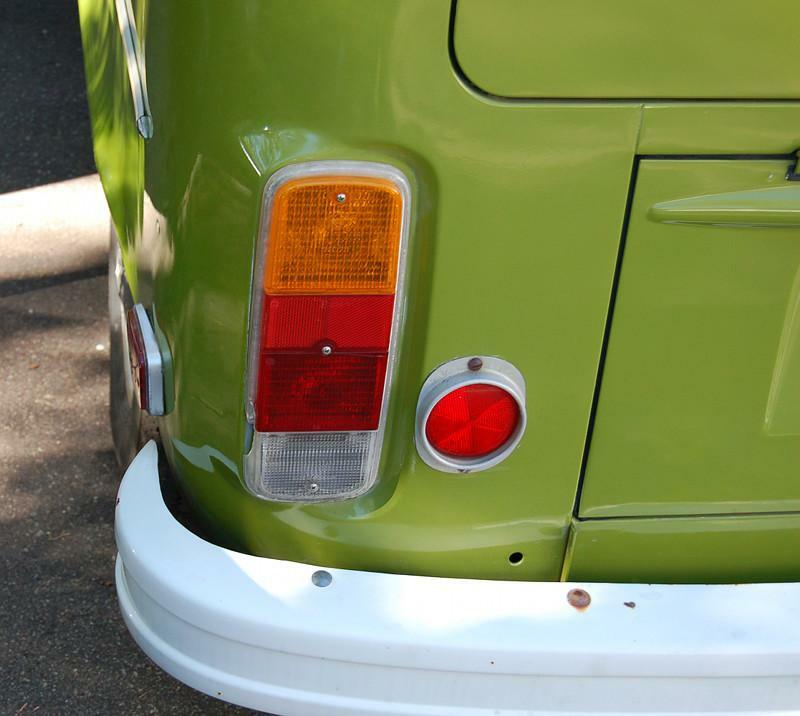 You might also notice the side marker light - only silver one on the bus and installed opposite direction to the RH one. 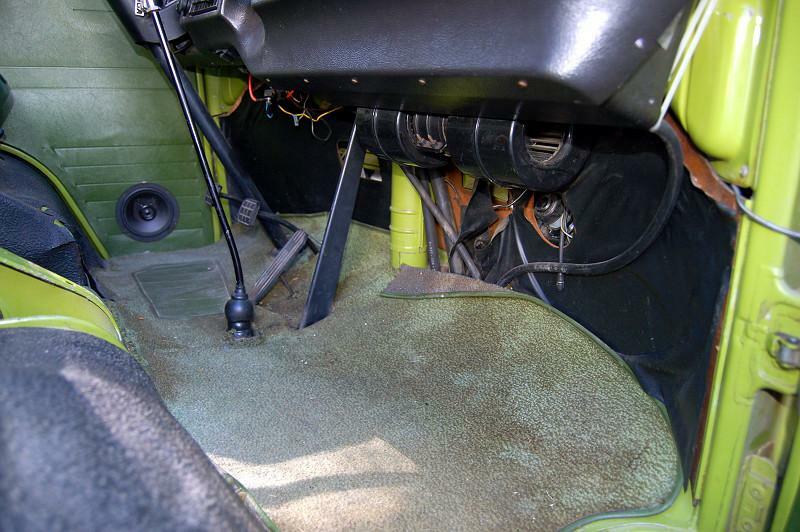 While we're here, how about a look at the engine compartment. 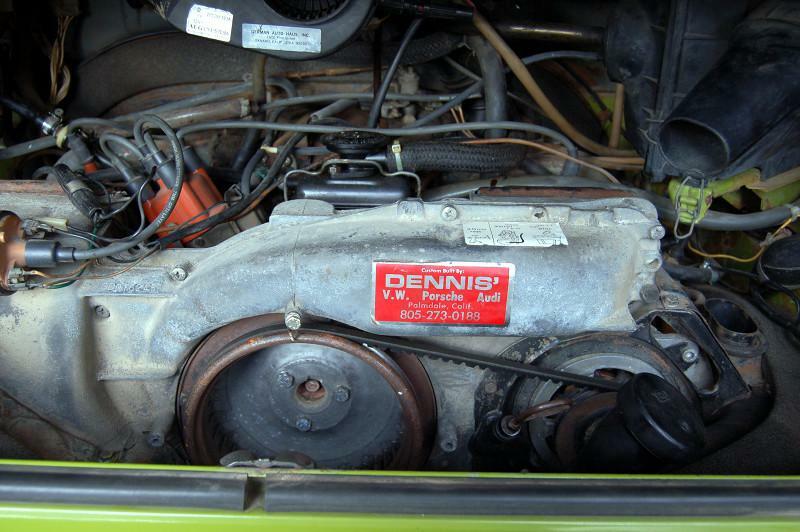 The sticker suggests the motor's been rebuilt, but when - no documentation, and Dennis' is no where to be found. At least it runs pretty well and the compression checked out very good! 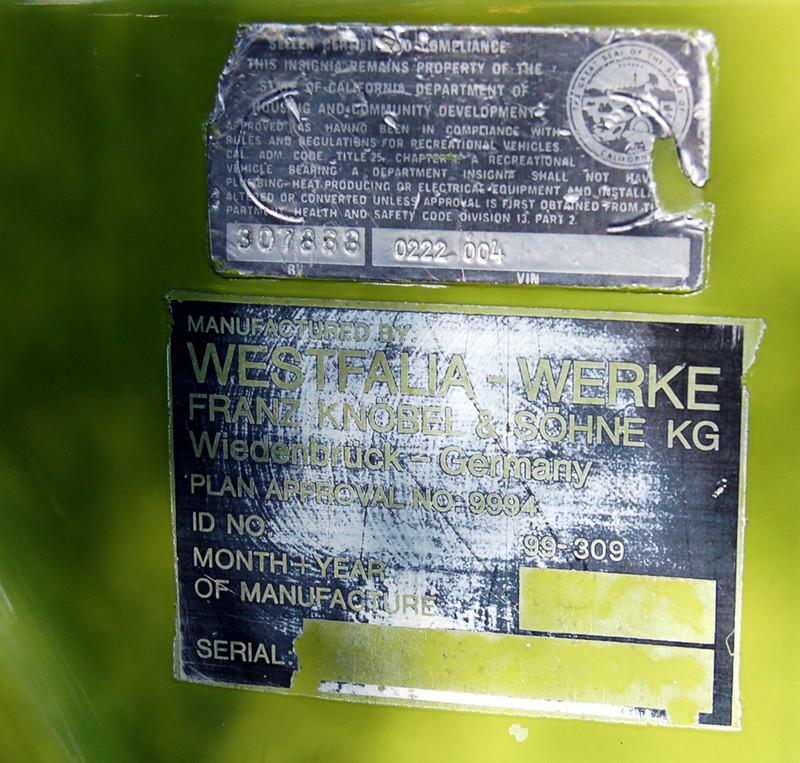 Coming around to the driver side front, here's what's left of the Westy and California certification stickers. You can see the feeble attempt to preserve them when the bus was painted. Like I say, the paint is shiny but it's not going to win any shows. Your Dad has quite a collection there. I've only ever managed 1 or 2 at a time. Have owned a '73 Convertible, '71 Mach 1, and a '74 Ranchero, but this '70 Mach 1 has been with me since 1985. Planning to sell it next fall and will be Mustangless for the first time since the early 80's! The VWs are intriguing. I can see where you and your buses might bring any number of people into the fold. I hope your Dad has the opportunity to try his hand on a good bus! Despite a few one-off parts, at least you can see the M-Plate without crawling around the dash. Everything checks out just as it should. 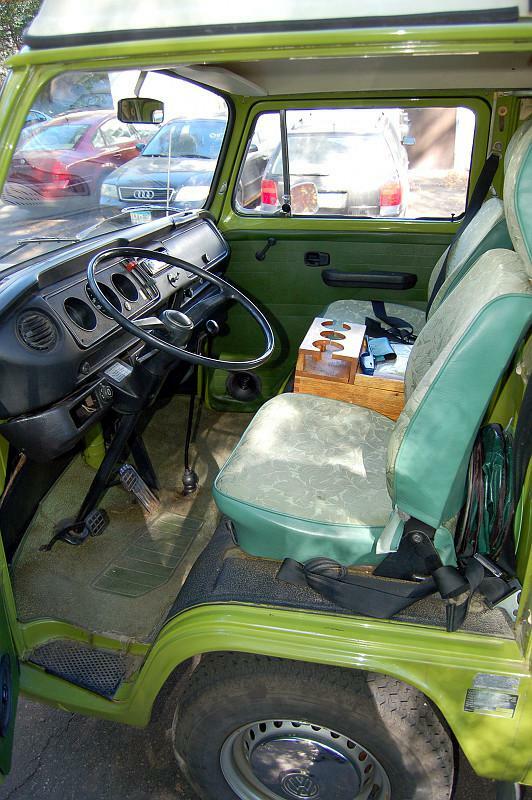 Legit deluxe Westy with Sage Green paint. Almost forgot, here's the stickers just back of the driver's seat. No small table back there though (new one just arrived today!). The condition is well ... unrestored. It's got 150K miles on the clock and shows it. But as you will see, it's really pretty restorable! Original Air Conditioning still in place, kind of. 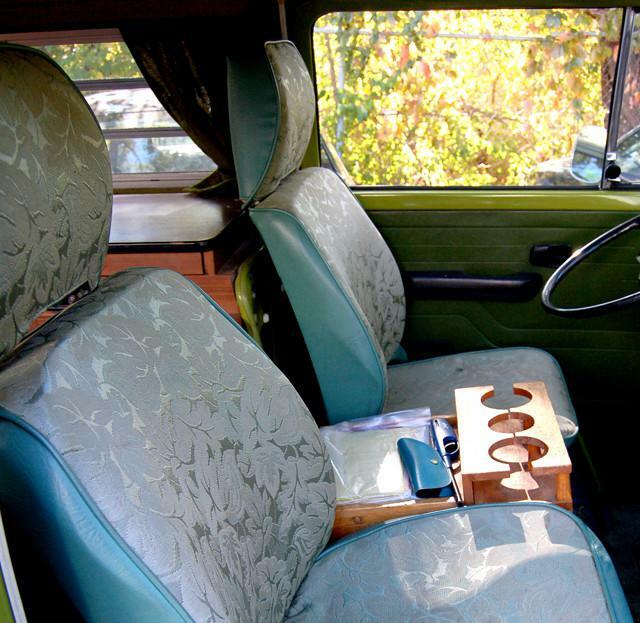 How 'bout those seat covers and custom middle box/cup holders !?!! Here's the other side. Can't say the seats are any prettier from this angle, but I've seen much worse in the classifieds! Back over to the driver side dash. Everything just looks kind of sad and neglected. Lovely little swively thing immediately under the aftermarket radio, but the screws are small and just happens to sit right where a decal should be. Missing emergency flasher knob, ashtray, front table support brackets, A/C vent, guage panel screw, etc ... but dash is in good shape with only very small crack. 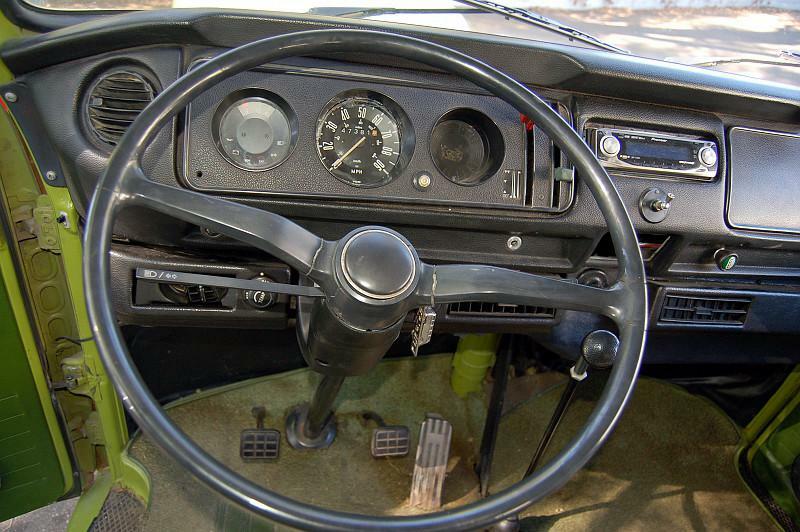 Steering wheel is another matter though. Here's the right side of the dash. A/C clearly hanging off unattached. Turns out to be undamaged, just pushed down by ductwork apparently from to radio install. Not a lot of pride in workmanship there, Previous Owner. Carpet is original, for what the hell that's worth. Still, I'm going to pull that baby and see how far I can get it. No hope for that leftmost edge though. 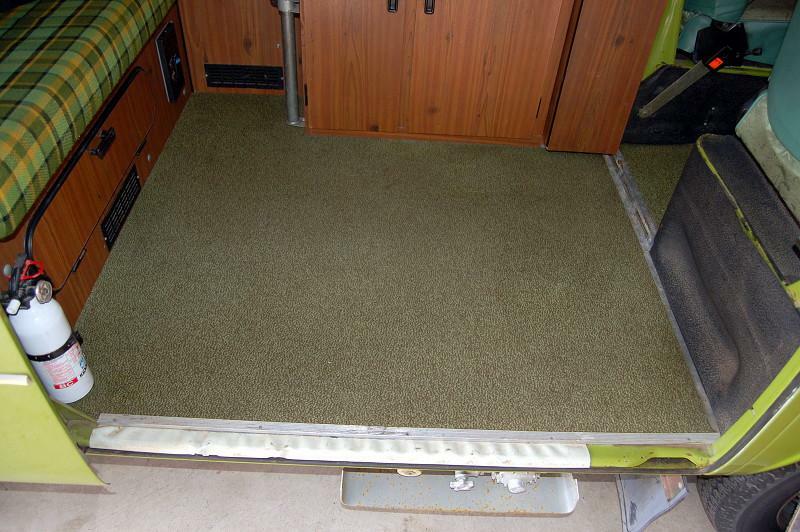 Here you can see what I'm up against in terms of the kickpanels and carpet. The texture of the repro ABS kickpanels doesn't look anything like these originals. The cardboard material looks to be in good shape so I'm going to try to restore. Now here's a ray of sunshine! 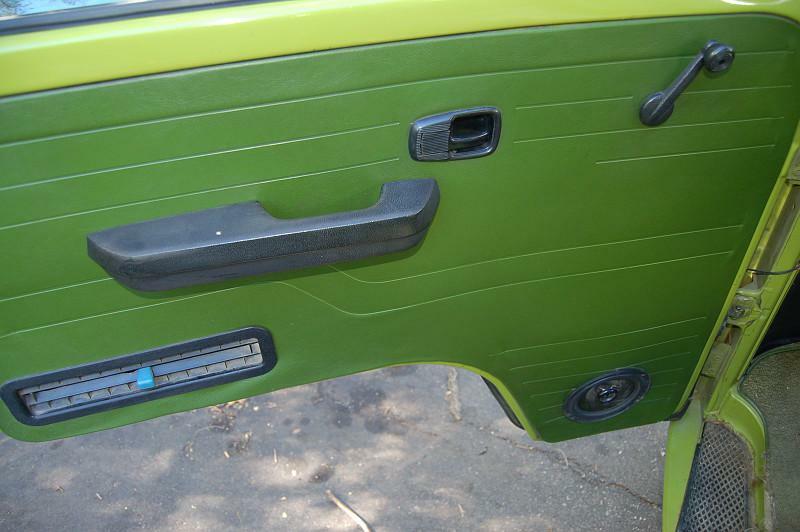 Tell me this original door panel isn't restorable! We'll leave the speakers in. Worse than the LH side, but still better than a lot of ones I've seen in many, many bus ads. The rust you see around the foot pad appears to be honest surface rust. Will clean up next year with warmer weather. Almost done ... just need to take a look in the back. The veneer isn't perfect, but sure is better than a lot I've come across. The chunk missing from the tire door was found later and looks like it might glue in place pretty well. Stove works, sink pump doesn't. Table isn't awful, but needs some help. Original headliners all solid and in good shape. Missing seatbelt hooks, coat hanger knob, seatbelt latch cover. 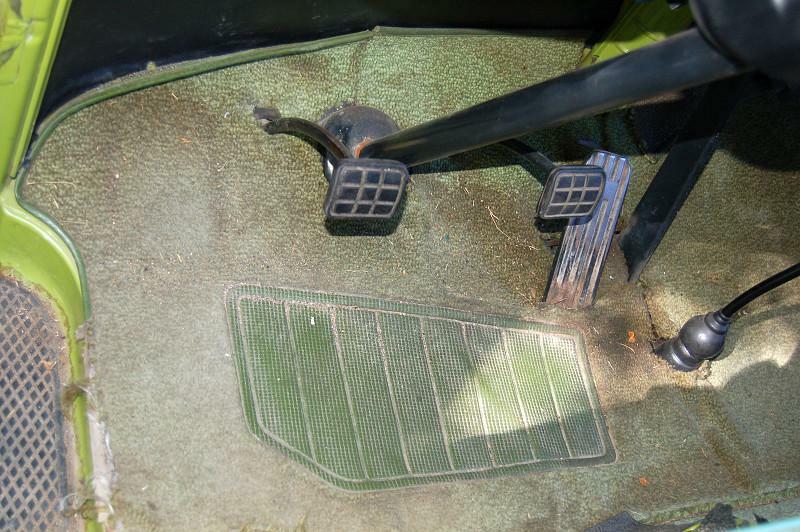 Original carpet. Actually greener than appears in photo. Seemed salvageable, and has actually cleaned up since nicely. What's that non-Westy upholstery on the left? 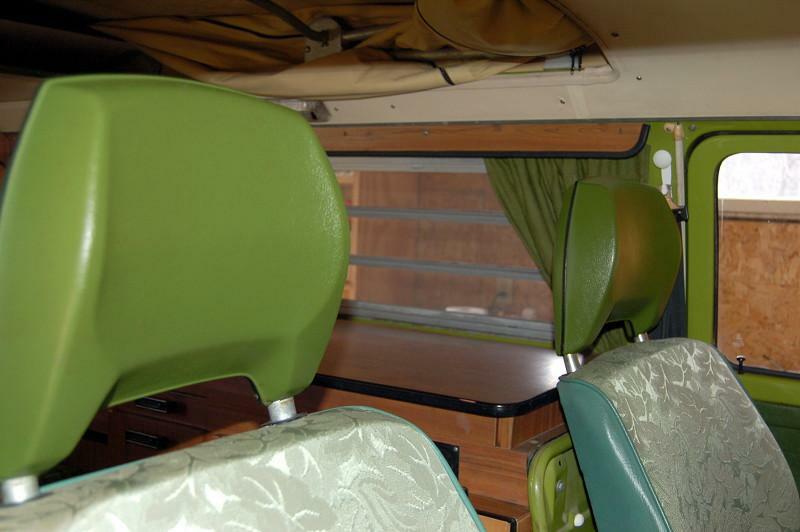 There must have been a competition to see just how many greens and patterns could be fit into a single camper. The owner has to have been in the running for a trophy. 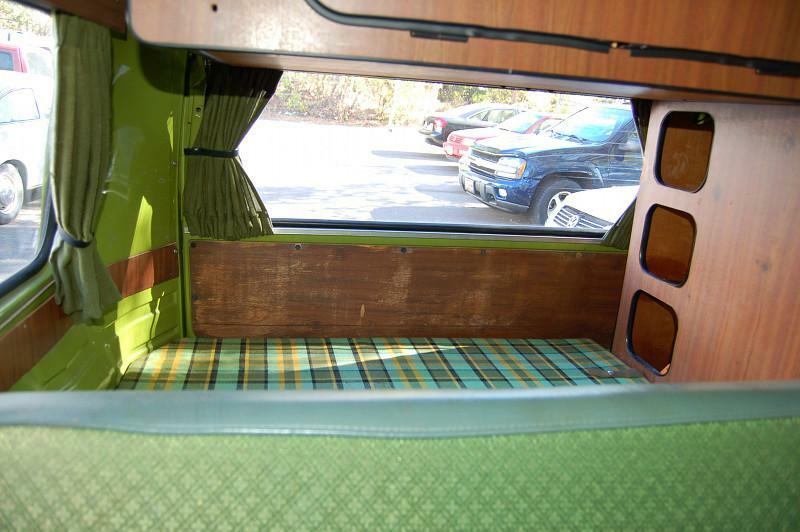 A look over the back seat reveals the first visible Westy plaid. It's sun faded, but otherwise in pretty good condition. 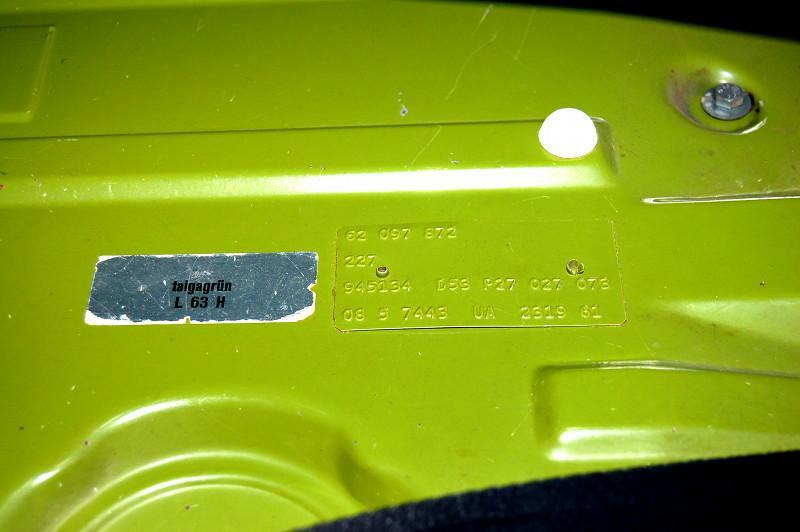 The rear hatch panel is worn, but seems very restorable. One other thing you might notice is that it has all of the original curtains and the retainers are there and in pretty good shape. When I bought the camper, the owner didn't think it still had its front curtains, but I found them after purchase tucked into a cranny. busdaddy - was just about to log out when I saw your post. Thanks for the compliments. It's no spring chicken, but it seems to have good potential. The plan for the bus is to camp in it late next spring (it'll snow and they'll salt the roads any day now, so no more driving for now). Although I restored that Mustang to concours level, this as you say is a camper and that's just what we bought it for. The focus now is on getting everything in order and then using it. That will include many cosmetics, but won't involve metal repair or repaint. I'll likely replace some exterior seals mainly to keep water out and slow the progress of any lurking rust. Above all it will be made reliable, although I'm nervous about the real condition of the engine. Will likely soon try to locate previous owners and see if anyone knows when (if?) that engine has been rebuilt. It's so dirty and corroded that I'm pretty skeptical. If it wasn't for the good compression and running smoothly I would have walked away from this one. I'll have to come back and get rid of those Samba-hosted Mustang photo links. Thought this might be a problem when I couldn't find the "other" category. I only included them to show I wasn't a total hack when it came to restoration, but understand where there would be a policy about this. Well, now that we have seen the whole thing, I say good find! That is a very promising platform with which to work. 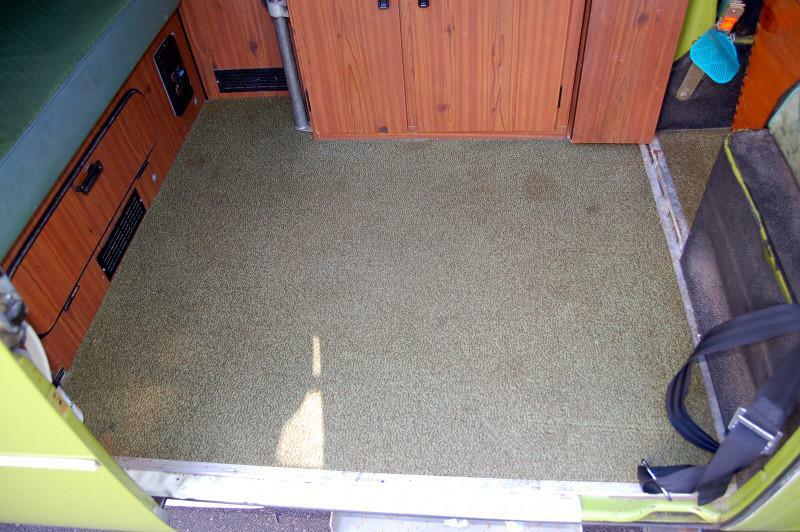 It is very possible to have a good, clean bus, and still use it for trips and camping. I have always said that the day I cannot use my bus (wisely) for its intended purpose is the day I sell it. It gets used judiciously for adventures, and because it is not a daily driver, the experience is just that much more rewarding. 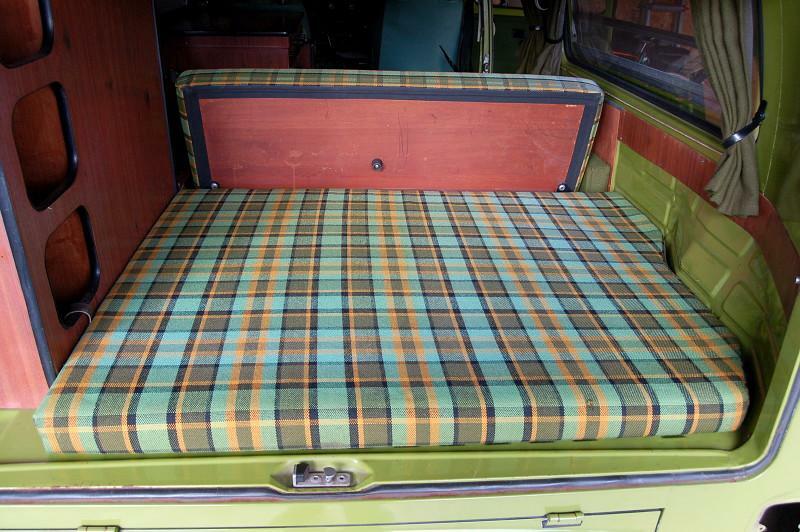 Wouldn't it be nice if the plaid was under those new fangled seat covers of yours? I know from your attention to detail that this will be great project to watch evolve. Thanks for sharing those camping thread links. They're major inspiration and will no doubt be revisited later again to remind me of why we're going through all this hard work. Some beautiful places there in that part of North America! The photos of this bus so far are as it was when first purchased nearly two months ago. I'm going to take some "after" photos tomorrow in hopes to catch this thread up to where it's at now. Nothing too earth-shattering, but there's been a few surprises, visible improvements, and significant missing parts replacement. Will strive to better keep up on photographing progress from now on. Now if only I could find the correct [email protected]&%$^@'ing heater blower. 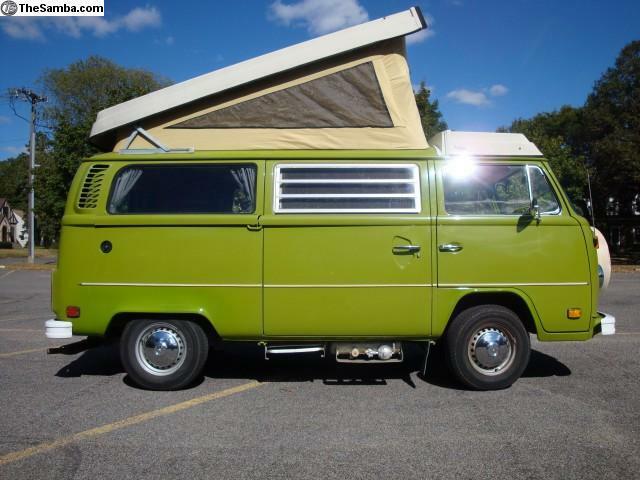 (ref:http://www.thesamba.com/vw/classifieds/detail.php?id=1387316) The last best hope was another red herring. Thanks busdaddy. Your help is appreciated. The first thing I did for our Westy was to order kits from German Supply to replace all the fuel and vacuum lines, along with new fuel filter and fuel pump. 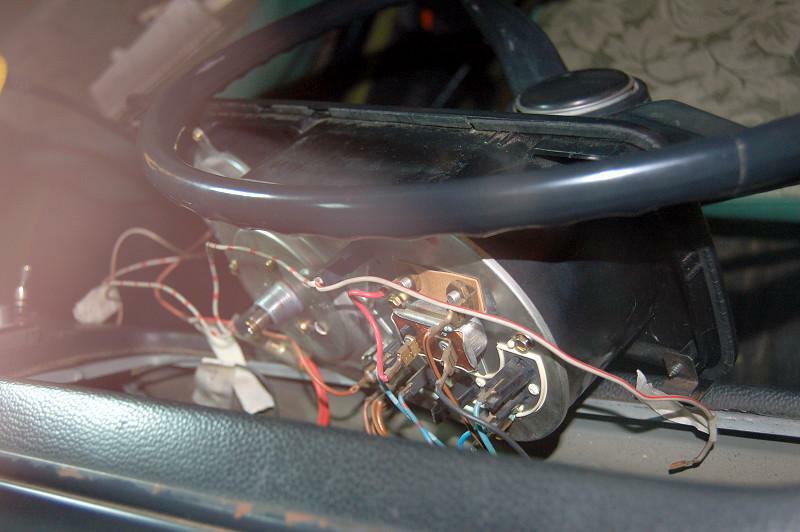 While waiting for this to arrive I began to fix the first thing sitting in front of me - the instrument panel. The panel was kind of a disaster. Not all of the retaining clips were there, which allowed it to sit kind of popped out and at a slight angle. Some of the warning lamps weren't working, the glass over the speedometer was falling out and slathered in glue, and the blank on the right was missing paint and had adhesive residue from some odd thing long since gone. Time to come out. 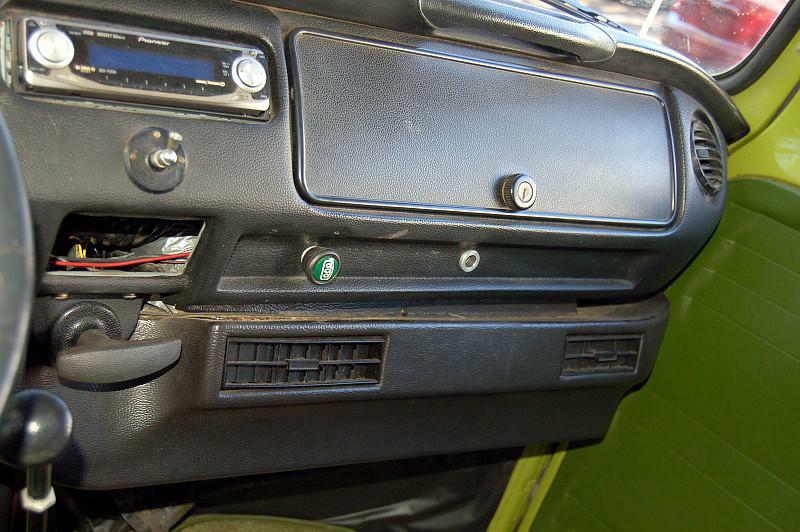 During removal I discovered the missing retainer had fallen inside the dash panel. Lucky break - one less thing to have to find. On the bench, you can see the shape it was in. The photo actually looks quite a bit better, as the warning lamp side glass was very dirty inside. 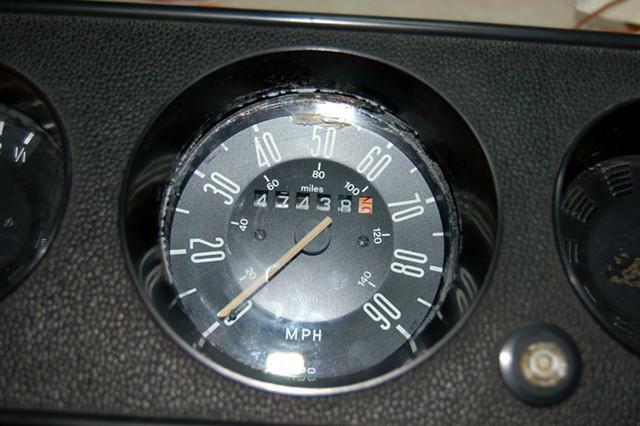 There had been a feeble attempt to re-attach the speedometer glass by trying to bond the glass face to the plastic. You can see just how well that worked. It took a lot of work to remove all of the glue and repair the original retainers to work as originally intended. I stripped the whole works down, cleaned everything, stripped and repainted the filler plate, and finished off with plastic polish. There wasn't much that could be done for the emergency brake lamp lens. Why this hasn't been accurately reproduced is a wonder as it is a simple plastic part used on many model years and it seems they all should have gone bad by now. Sure would be nice to have this red instead of milky white. I also hit the heater levers hard with de-greaser to try to clean them up. They're better and they're clean, good enough for now. Before I put the works back together I replaced all the lamps and used Ratwell's suggestion to upgrade the ones that light the gauges. With all the lamps working I could see the EGR light on constantly. Pressed the button on the little box below and the light went off. It's curious that there's also a place for a "CAT" light in the warning cluster. There is no wire and lamp holder in the wiring harness to support this light, and the little box near the floor doesn't have a reset button for the cat, nor a wire going to its connector for that purpose. 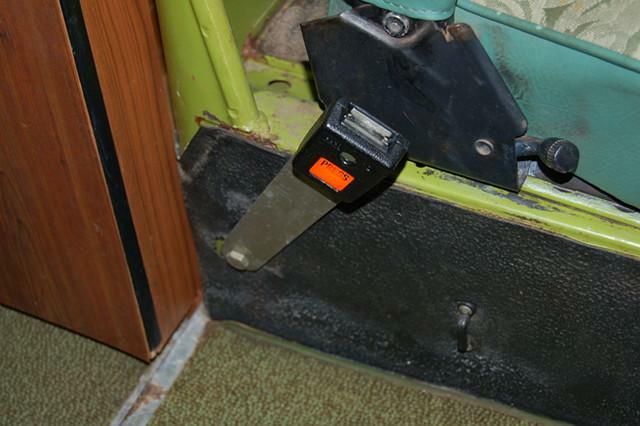 Yet, this is a California bus, built Feb '76, and wears a tag in the door area suggesting it had a catalytic converter. It seems likely converters came before CAT lights. Wrapped things up by rebuilding the emergency switch and replacing the knob and lamp. Also replaced the lamp on the rear defrost. Most recently found a pair of front table support brackets and put those back on. 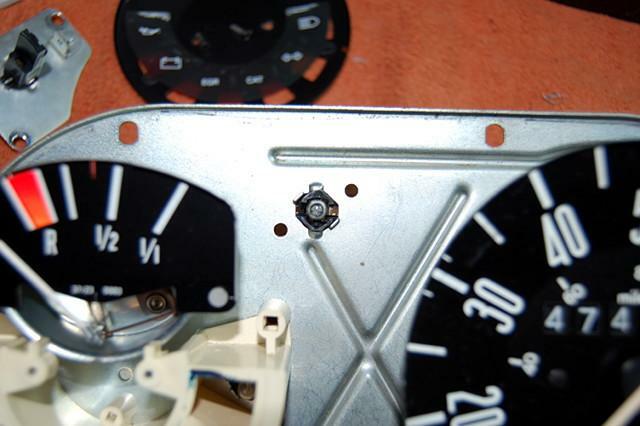 I'm thinking of using an iron to flatten out those small screw holes left after removing the funny swivel thing just below the radio. The Westy warning label should cover them nicely. On to the front seats. As I poked around under the cheesy headrest covers it appeared the original headrests were intact, but I couldn't really tell what kind of shape they were in. The solvents in the foam that lined the covers as well as some additional glue around the edges didn't provide much hope, either. I'm sorry I didn't think to take photos at the time. Trust me ... they were really sad looking, crusty yellow and black residue nearly covering them. 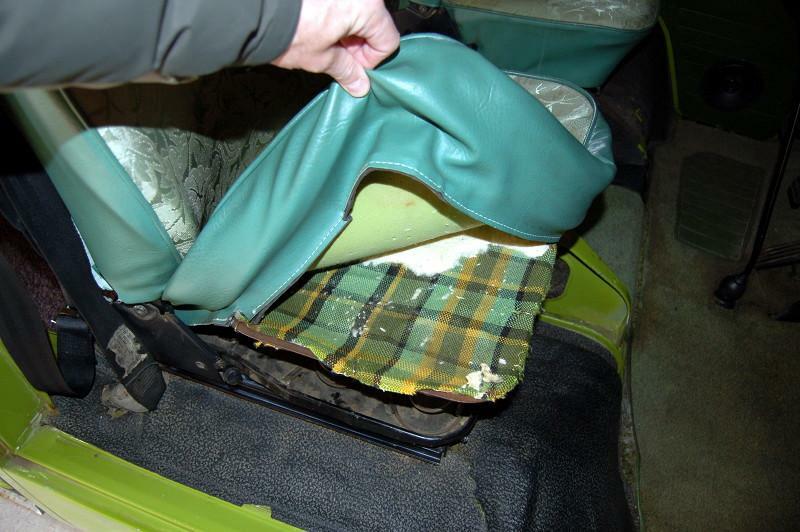 It took some work to pull the headrest covers off, but as I peeled them back I could find no cracks or chunks taken out of the original green plastic. There was foam residue nearly bonded to the plastic though, but beginning with a vinyl cleaner and a rag, then a stiff brush with wax & grease remover I found the yellow residue coming off ... and LEAVING good green behind. It took about 2 hours of work to get them clean, but here are the results! (The difference in color is due to the camera flash. They both came out the right color). 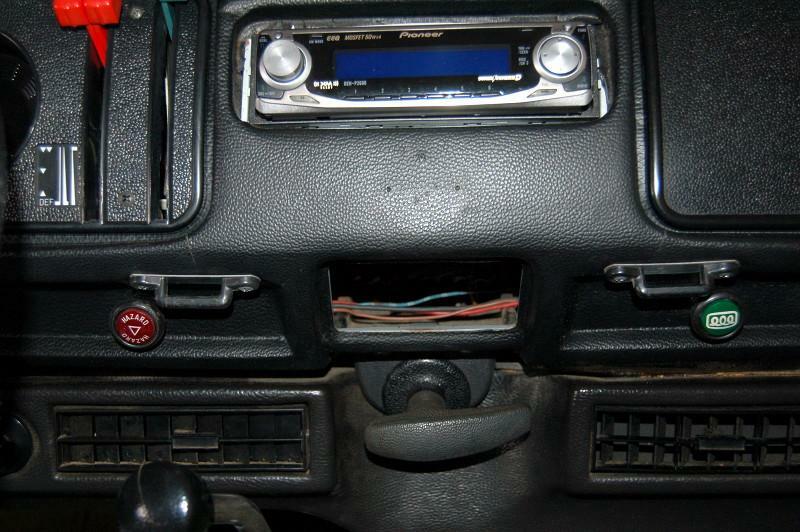 You might notice I also replaced the missing seat belt hook and coat hanger knob. I didn't want to tear into the front seat upholstery just yet as we intended to drive the bus a little before it got too cold. I did pull back the covers though and found about the same thing on both sides. It looks like a previous owner removed the original horsehair pad, then used the old upholstery as a barrier between the spring and the rest. The cheesy covers aren't even hogringed on so it won't take much work to remove them. Note the ragged white padding ... this will appear again in a later post. 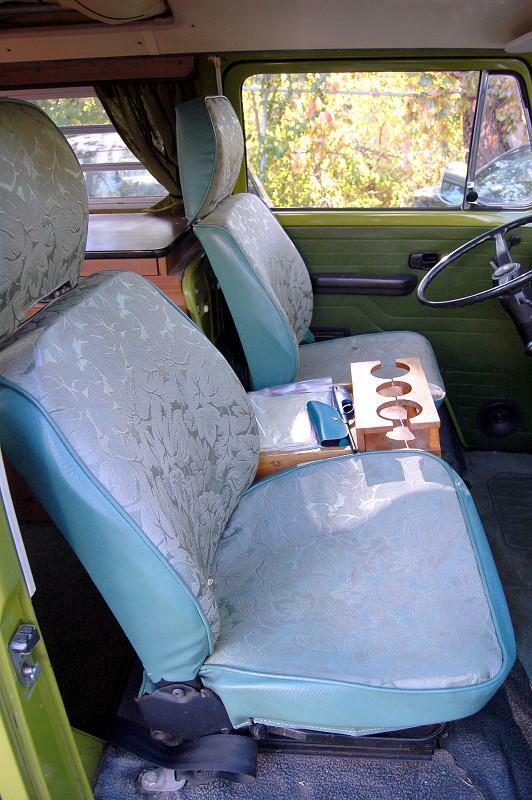 The plan is to replace the front upholstery in another month or so. It's a good winter project, and we have new horsehair pads waiting for the install. 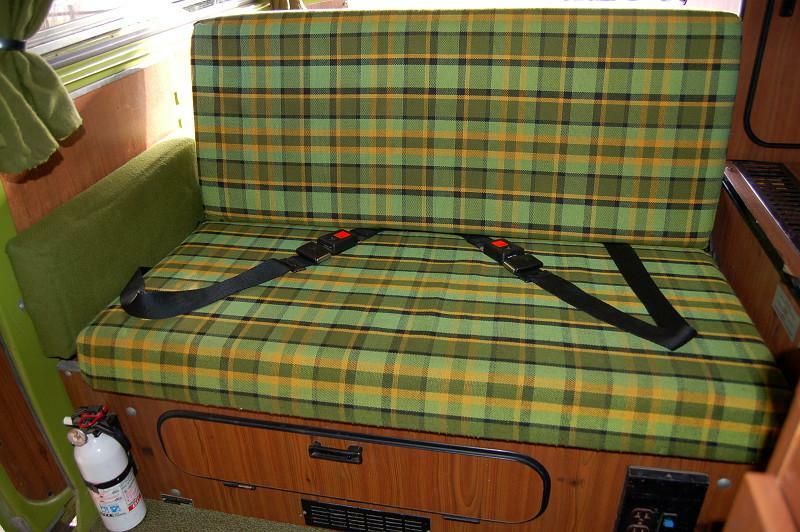 That original Westy upholstery may come in handy for a fixing a few things down the road. Oh yeah, that missing driver side seatbelt latch cover - replaced. It makes it much easier to find the release without looking. Nice bus, I hope it will look as good as your previous car. To the back seat (please bear with me, just trying to catch up to where things are at now). I began poking around the edges of the cover that surrounded the rear armrest cushion. The cover was stapled all over the back so I was cautious, but as I probed I found Westy green fabric so I began pulling more staples expecting to find some damage. With the cover removed, I was looking at a very "pilly" and somewhat sun-faded original. Emboldened, I tried the same tact with the lower rear seat cushion. Staple after staple I removed, all along expecting to find a rip, bad stain, or hole in the underlying foam. I found none and so just kept on going. It was a ton of work removing perhaps 200 hundred or so staples. The suspense was enormous as I really expected disappointment - why would the seat have been covered this way? Hours later I was rewarded with the sight of good foam and only somewhat sun-faded original Westy plaid. It took a lot more time to vacuum, wash, and remove spots but I think it paid off nicely. I also completely disassembled the seatbelts and soaked them clean. They were stiff from years of sitting and now nice and supple. You can see the armrest foam has shrunk somewhat since new, but its good enough for now. Lastly, here's a look in back of the seat. You can see the pad is pretty faded but it cleaned up well. I used hockey-stick tape around the edge of the back seat fabric as recommended in a thread here. You can see its wider than original - there's a reason - I had to try to cover up the staple holes left by the awful cover installation. Can repair some day when re-staining that panel. While we're back here, let's take another look at that carpet. This is the result after spot cleaning and vacuuming. Haven't shampooed it. Not bad! Looking good. I'm guessing the rear seat was covered due to some messy kids and either working at an upholstery shop or having a buddy that did. 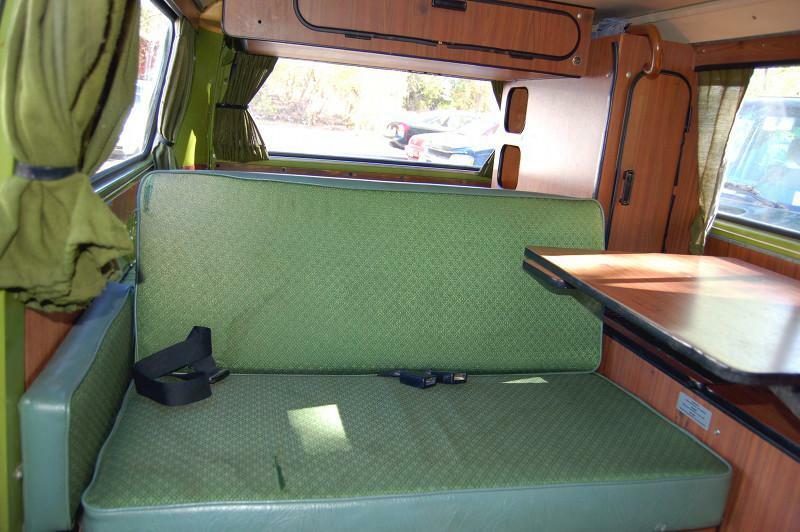 Been following your thread-welcome and congrats on your Westfalia endevor. Thats the Camero sleeping during the winter time in the garage. busdaddy - thanks for looking today. It'll be interesting to see if the one out of a '77 is a match. They seemed to change almost yearly. Lots for sale over the last couple of months, none like the one I'm seeking. 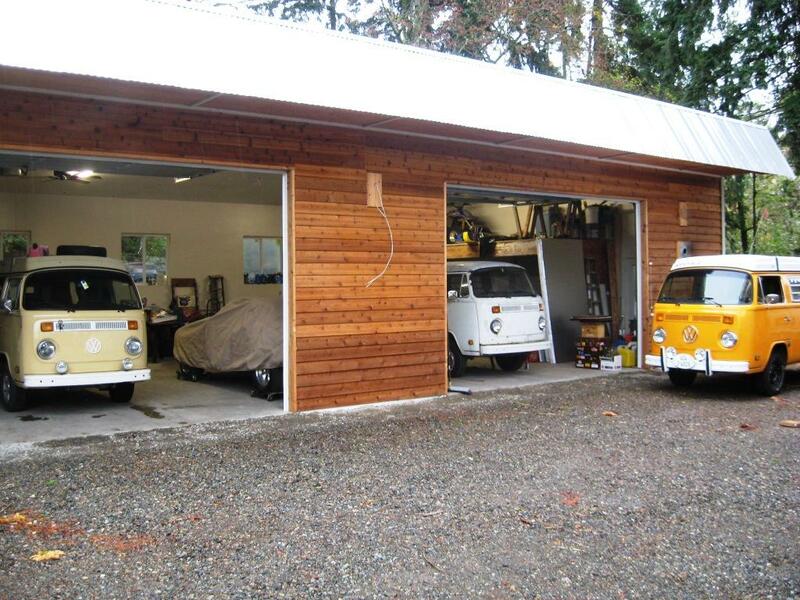 notchboy - that's one heck of a garage and collection of fine automobiles. Good to see I'm not the only one here with a musclecar and don't mind its a camaro one bit. Very nice. The video drives home the difference on the highway between these cars. I'm used to seeing cars disappear in the rear view mirror while driving the Mach 1, but seeing cars riding my rear bumper in the Westy. It's a whole other mindset, and I'm fine with that. Thanks to everyone for their support. Honestly, without this forum I'd never gotten this far. Not even close. This is the kind of thread I love to watch! Couldn't agree more. Love these threads.